You know how London buildings always get nicknames (gherkin, cheesegrater, giant glass testicle, yada, yada, yada)? Well we’re wondering what this one’s going to be called. The Translucent Egg? The Floaty Ovum? The Breast Implant? 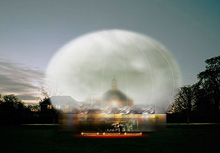 This is the cracking design for the 2006 Serpentine Gallery Pavilion, by Rem Koolhaas and Cecil Balmond. 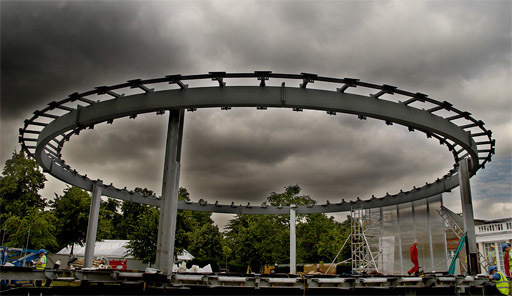 Each year, a leading architect is asked to create a striking and innovative temporary structure to adorn the grounds of the Serpentine Gallery, Kensington Gardens. This is the latest, and it’s already half built. That big, white ovoid is a floating canopy that can be raised or lowered depending on whim and weather. Beneath the great balloon, you can dine like Richard Branson in the pavilion café while taking in one of the many talks and film screenings planned for the structure’s three-month lifespan. Olll.com have been documenting the construction of this and previous pavilions with a series of regular and beautiful photographs (the one below, reproduced with permission, is from 27 June). The egg will be cracked open on 13 July before being scrambled on 15 October.